One area of business CD-i succeeded in was in the professional market, even way after the games market on CD-i was already dead. 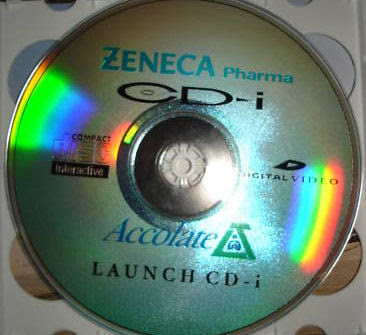 For those long enough around the CD-i web will remember the name Zeneca. It was once featured at the site 'The World of CD-i' with an interesting video. The video showed the content of the Zeneca Pharma CD-i, which was sort of a medical guide to all products Zeneca offered. The interesting part in my view was the use of Digital Video on the background while showing thumbnails and menus on the screen. The content was technically impressive on CD-i, although it was ' just' a professional title. I tried to find the video again but it's nowhere available as far as I can see. Some old members of the 'Le Monde du CD-i' team should be able to get it back, but unfortunately there's no news on that since ages. The reason I mention it is because I saw a copy of this on ebay: that might be the first one I see on sale!